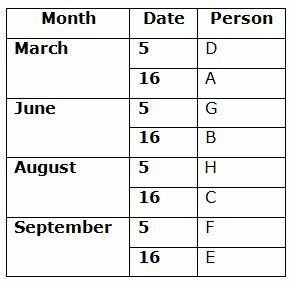 Eight persons are born in two same dates 5th and 16th of the four different months viz., March, June, August and September of the same year. Two persons are born between B and F, who born in one of the months which has even numbered days. B does not born in odd numbered date.As many persons born between D and G is same as the number of persons born between H and G. D is not younger than H.Two persons are born between A and H. A does not born in the month which has even numbered days. Only one person born between E and C, who is not the youngest person. 1. 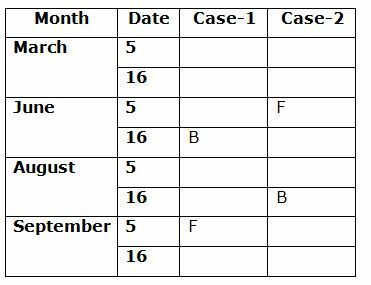 B was born in which of the following dates? Two persons are born between B and F, who born in one of the months which has even numbered days. B does not born in odd numbered date. As many persons born between D and G is same as the number of persons born between H and G. D is not younger than H.
Two persons are born between A and H. A does not born in the month which has even numbered days. 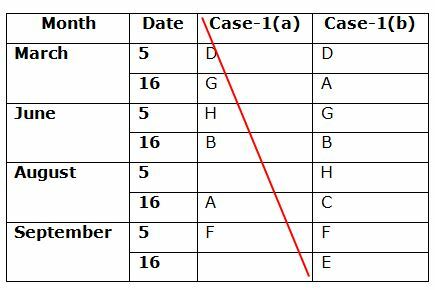 So, Case-1(c), Case-2(a) and Case-2(b) will be dropped. Only one person born between E and C, who is not the youngest person. So, Case-1(a) will be dropped. 2. How many persons are born between G and C? 3. Which of the following persons are born in August? 4. Four of the following five are alike in a certain way and hence form a group. Which one of the following that does not belong to the group? 5. Which of the following statements is true? 6. Which of the following is sixth to the left of the fifteenth from the left end of the given arrangement? 7. How many such numbers are there in the given arrangement each of which is immediately preceded by a consonant but not followed by a letter? 8. How many such symbols are there in the given arrangement each of which is immediately followed by a letter but not immediately preceded by a number? 9. What should come in the place of question mark(?) in the following series based on the above arrangement? AM3 @U5 WYB ? 10. Four of the following five are alike in a certain way based on their position in the given arrangement and so form a group. Which one of the following that does not belong to the group? Other than #9D, all the elements in the remaining options are alike in such a way that the first element is exactly in between the second and the third elements. 1) B was born in which of the following dates? 2) How many persons are born between G and C? 3) Which of the following persons are born in August? 4) Four of the following five are alike in a certain way and hence form a group. Which one of the following that does not belong to the group? 6) Which of the following is sixth to the left of the fifteenth from the left end of the given arrangement? 7) How many such numbers are there in the given arrangement each of which is immediately preceded by a consonant but not followed by a letter? 8) How many such symbols are there in the given arrangement each of which is immediately followed by a letter but not immediately preceded by a number? 9) What should come in the place of question mark(?) in the following series based on the above arrangement? 10) Four of the following five are alike in a certain way based on their position in the given arrangement and so form a group. Which one of the following that does not belong to the group?